Hey guys--want to say once again how thrilled we are with how the contest turned out. Great turnout and great entries. 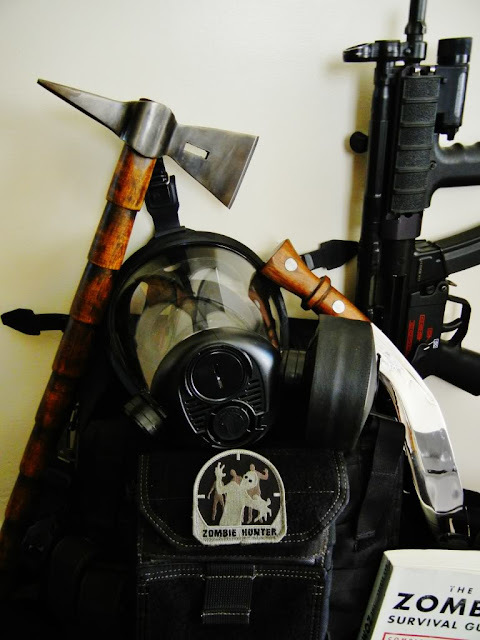 Due to the success of the Zombie Weaponry Contest, we're looking to do more/similar stuff in the future. Our next contest should be bigger and better, so stay tuned. Creativity, style, composition, photo quality and overall coolness factor, with creativity and coolness being the biggest factors. After hours of deliberation and careful consideration, we have made our decisions. Click below to find out who won! This was a tough one, but after long arguing, we finally decided on KingHoju's entry. Cool gear, fun write up and the only entry to feature a crowbar. You can check it out here. Ed's entry led the pack in terms of creativity, composition, photo quality and sheer coolness factor. What can we say--we have a soft spot for MP5s and high-end blades :D You can find Ed's winning entry here. A special mention has to go out to A.L., for sheer quantity of gear. Looks like he could equip an entire legion of zombie slayers. Check it out here. That's a wrap! Stay tuned for another contest starting up here in the next couple weeks.